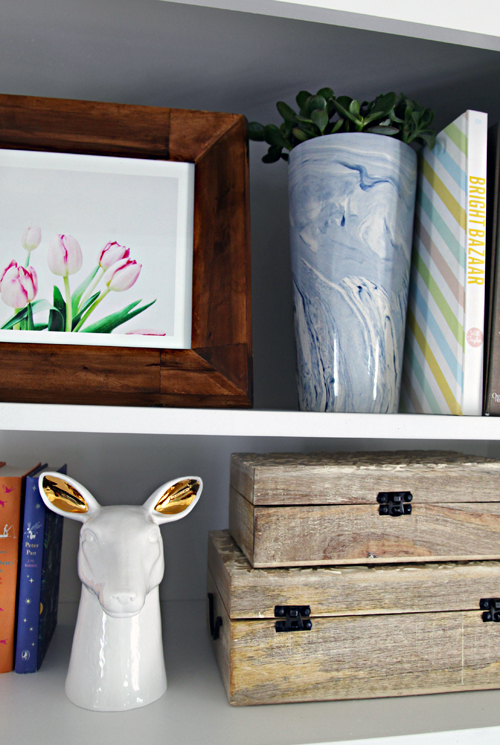 IHeart Organizing: One Room Challenge Week 6 - IHeart Living Room Reveal! 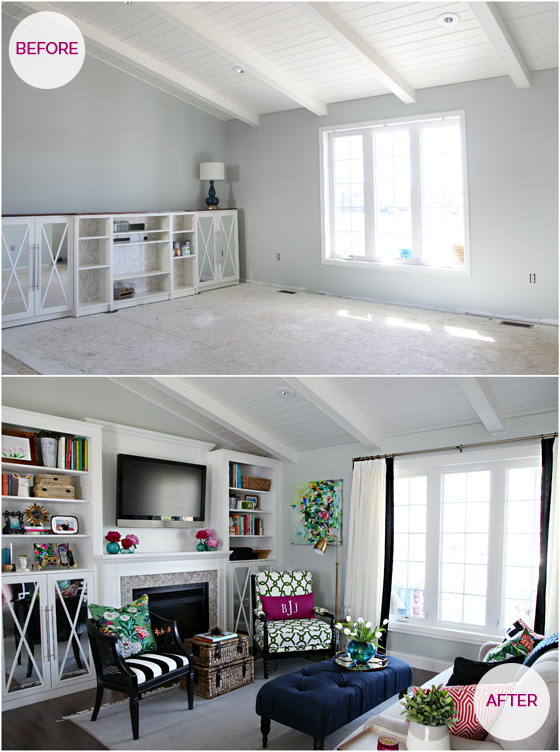 201 One Room Challenge Week 6 - IHeart Living Room Reveal! 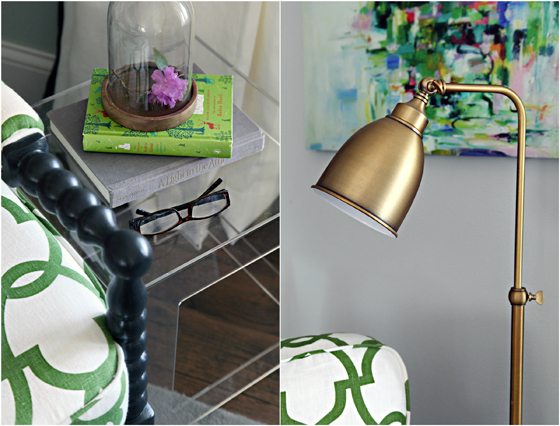 Welcome to Week 6 of the One Room Challenge being hosted by Linda of Calling it Home. You can see our plans here and follow all of the progress here. Today my friends, is REVEAL day! It is here! The moment I have been building up for the past five weeks. Yes, if you do the math, I shared our plans just five speedy weeks ago, and today we are kicking our feet up and enjoying our new living space! Oh the difference five weeks makes! Heck, such a dramatic difference just in the last week! I can honestly say that this challenge pushed me in endless new ways. I appreciate you hanging in there through my indecision, my meltdowns, my highs and lows... This has been by far the biggest transformation we have tackled in the shortest amount of time! Are there things we didn't check off the list? Sure, about fifty of them. And not everything turned out as planned either. But I couldn't be more excited or thrilled about how far we have come. In fact, this room is filled with project after project and hour after hour of our hearts. That is what we love most, so much DIY to make this space our own. What did we tackle ourselves you ask? Everything from installing new floors and trim to building a giant fireplace surround to painting the chairs (multiple times) to constructing and tufting an ottoman. Oh, and we also DIY'd the mirror, reupholstered a chair, installed all of the hardware and new lighting and painted the shoe cabinet. Hot dang! Labor of love is an understatement! As I mentioned, the outcome and direction of the room shifted over the course of the weeks, yet the ultimate goal remained the same. We strived to create a space that is family friendly yet stylish, bold and colorful with a side of traditional, playful yet mature, unique and a bit unexpected, all while being filled with pieces that speak to us. Nothing in the space is too precious for family living, yet there are moments that feel like we have grown up a bit. I think what I love most about this process is that it allowed me to show how a space evolves over time (even if that time is only a few weeks). The middle really made no sense, even to me, but after everything started layering in, it really came together beautifully. Textiles and accessories really made all of the difference, everything from the stunning black-banded pleated curtains (thank you Tonic Living!) to the pillow and chair patterns to the neutral rug and sofa. Although someday we hope to add a formal entryway to the front of our home, for now we are stuck with the smallest landing in this history of landings. And we are front door people (the garage is used for projects, not parking), so we didn't want to mess with the long lasting system that works hard for us. 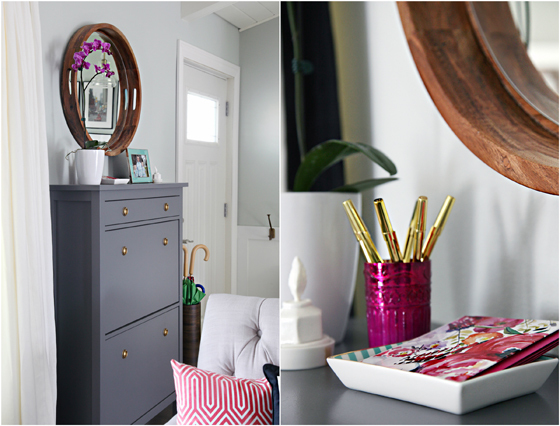 Right inside the door lives a slim shoe storage cabinet, which we painted a beautiful gray, as well as a credenza which functions as storage cubbies for the boys. 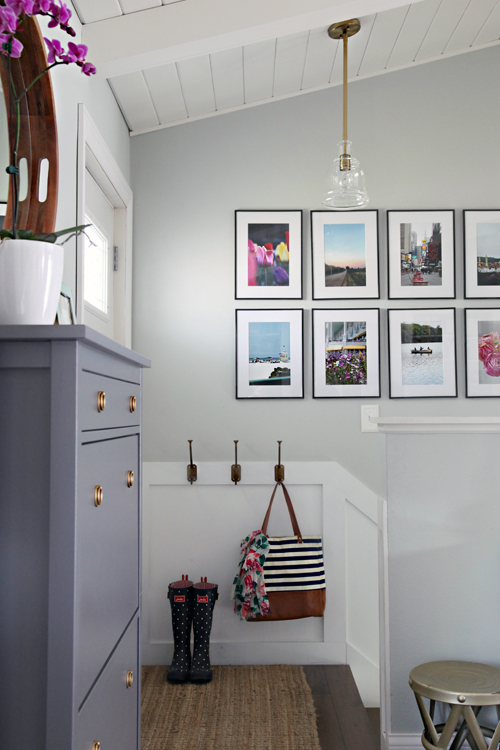 I really enjoy taking photos so I selected a slew of my favorites and had them printed and framed on the stairway wall. I love that they bring a splash of color to the entry area and tell some of our favorite stories. The painted shoe cabinet is holding up beautifully and is a prime spot to drop keys and a wallet while also providing a place to hold blank stationery and pens. The room is long and narrow, so we used a large area rug to divide the space into two functions. It really allows us to create an "entryway" where there was none, and to also define a cozy living area. 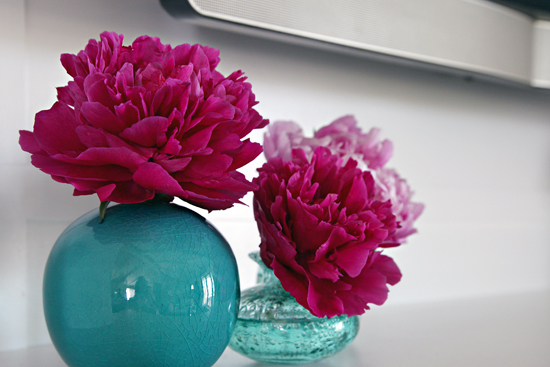 I had beautiful peonies the first day I shot photos... they died overnight. #sadfacedflowerkiller Day two I was saved by a bunch of beautiful blooms clipped from shrubs in the front of our home. Both days our living area smelled divine! The entire project started off with a floral fabric as my inspiration, and to my dismay, I was unable to get my paws on it in time because it was back-ordered. The new plan was to use an alternate fabric that had all of the same colors (our home's signature palette), so that when the floral option arrives someday, I can swap things with the seasons. I landed on Schumacher's Jade Chiang Mai (which I found on eBay), and it really provides a beautiful, colorful moment in the space. It has a matching friend across the room on my Craigslist chair. I am a sucker for pretty white painted furniture and I appreciate that it typically cleans up nicely, even with kids. And even though I initially held our chair fabric up to both a black piece of wood and a white piece of wood, and we voted on the black combo, my gut went with what it knew and selected white. I thought black would look too "fancy", while white is more casual. But the chair and I got in a fight and I admitted I was wrong so we hugged and made up just after it received two fresh coats of black paint. The black turned out to be a gorgeous contrast, yet still remains unique and playful. Being a bold pattern lover, this chair makes my grinning cheeks sore. We selected so many neutral elements throughout, that I needed one bold moment and that was it! 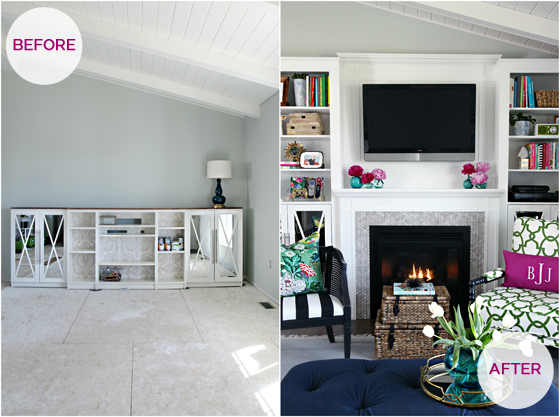 There is no doubt that the biggest change to the space was the addition of the fireplace and built-ins. This major moment was just finished up on Saturday! But boy-oh-boy are we going to love every last bit of having a nice warm fire and a TV we can see from anywhere in the kitchen, living and dining areas. 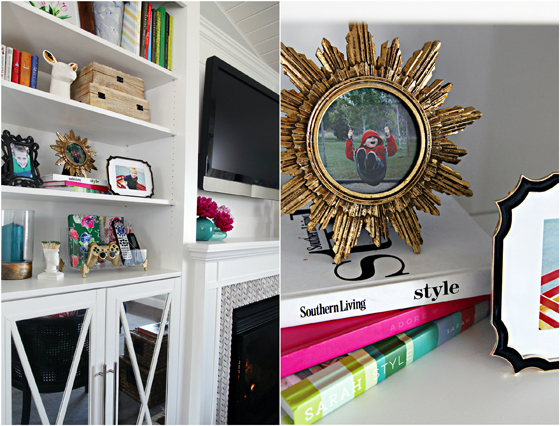 The room needed layers and our personal touches, and the shelves offer a place for special pieces to land. Everything from books to crayons to portraits, each shelf tells a story and provides both open and concealed storage for living room essentials. And the tile had me at hello! It literally grabbed me as I was walking the aisles at Home Depot. Although we had already purchased something else, and when I spotted the herringbone marble, I knew it would be mine. Thank goodness stores take returns. Although there were things that didn't go right, that we made mistakes and course corrected, that we worked up to the absolute last minute and stayed up way past our bedtime too many nights to count, that I may have hit up seventeen different HomeGoods stores and gotten a flat tire in the process... We are gosh darn proud of how much we accomplished in such a short period of time! The room is cozy and friendly and functions just as we hoped it would. And although we have only lived with it for a few days now, we love that it offers flexibility and that we all have a place to plop down with a good book or to catch up on our favorite sitcom while chatting with the folks in the nearby kitchen. I can't wait to continue to make this space feel like "home" for many years to come. Other than shoes in the cabinet by the door, we haven't officially "moved in" to any of the other storage spaces yet. You can imagine I am super excited to do that over the next few weeks, although, my youngest already claimed the baskets by the fireplace for his toys and books. But first, I need a small break and just plan to enjoy the space for the next few days before taking on any more projects. Being such a large space to transform, I could ramble on about every last moment for hours. I apologize if my mush brain forgot to touch on anything, but I will be back with more details over the next few weeks. I am just grateful that for now we can say we completed the challenge with goofy smiles and huge high fives. And low fives. And on the side fives. And too slow fives. Are you ready to hop on down the line and oooh and ahhh over the rest of the One Room Challenge spaces? I hope you have a dentist visit scheduled because today is sure to be one sweet source of room eye candy! Chair fabric, custom sewn curtain panels and window hardware provided by Tonic Living / Floor lamp provided by Wayfair. Art provided by Minted. Styling Accessories provided by Waiting on Martha. IHeart Organizing is extremely grateful to have the help of special sponsors to finish this room in just a few short weeks! So bright and beautiful, Jen! Love all the colors you incorporated into the room. Such a lovely space. You must be so thrilled with the results. Love everything! I have so enjoyed the process of this transformation and it came out beautiful! Enjoy your space! Wow this looks amazing! I love the accent chairs and the wall frames! You did a great job! What a beautifull room! Love it, great work!! Amazing as expected. 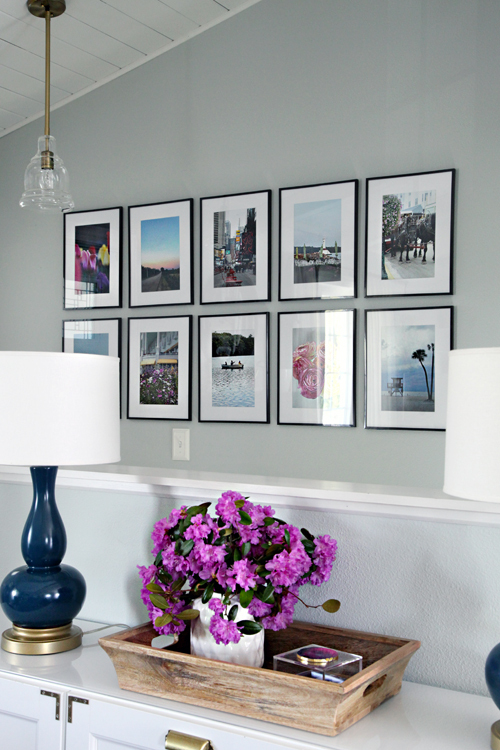 I know it's a small thing given the size of the project but I just HAD to gush about your gallery wall. I don't know if it was easy or agonizing but IMHO you attained perfection and I am so inspired. That all the photos are personal, that they all look colorful and magazine-worthy, and the gallery itself is so balanced its almost a mosaic, is amazing and inspirational. I must have personal touches and yet I like classic artwork and this gallery seems like a perfect marriage. Well done sista! HOLY WOW!!!!! This room looks amazing, You did such a good job! 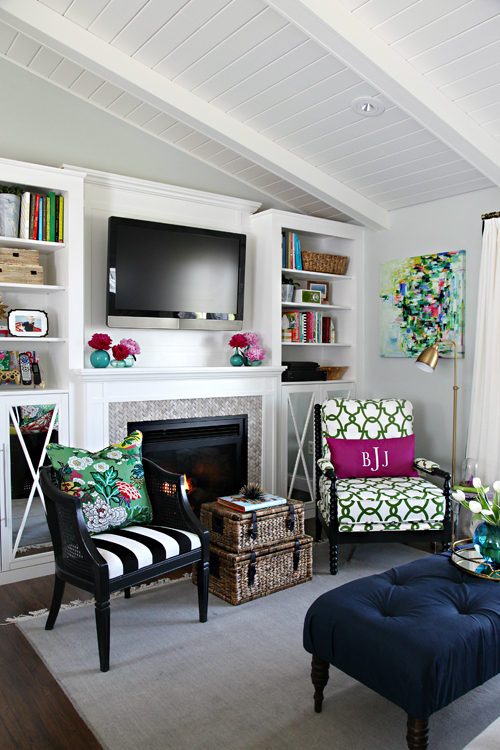 I love the green floral fabric, the black paint on the chairs, the amazing built ins, everything! It is A-MAZING!!!!! Oh my gosh, Jen! Just beautiful!!!! Not that my opinion matters, LOL, but repainting the chair black was such a good call. I just love what you did. You and Bryan should be so proud. Your living room is just gorgeous. Yes, please enjoy your beautiful work for a few days! I love it all. I keep looking back at the before in awe!! How is it having chairs so close to the built-ins (or does it just look that way?). We have a similar set up and I think the chairs would inhibit opening of the lower cabinet doors. Thanks Jen! I just came back to check if you had answered my question ( I was reading your new post and I remembered I had asked you one!). :) Great info and I just love the fireplace wall! You guys are so talented! Absolutely beautiful!!!! I was so excited to read this post. I texted pics to my sister right away and was like "look how awesome this is!!" So much work and I love the colors. I absolutely love the room! One minor comment (after taking an upholstery class)...does the fabric pattern on your chair (front and top panel) line up when you turn it around? really pretty! the banded drapes are a fave, and the green dragon pillows are the perfect pattern and color for the space! WOW! Love the transformation. 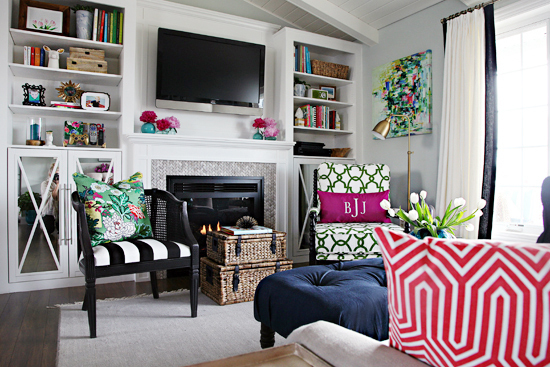 All of the colors and patterns look great together and the built-ins are something else!! Absolutely beautiful. You should be so proud to have created such a stunning home. Wow--you did an outstanding job Jen! I sure hope you get to nap today. =) Or all week? I love all the color, the pillows, the curtains. Bravo. Can't wait to see your finished kitchen too! The space is beautiful... but can we focus for a moment on that gold video game controller? I would love some details!!! Looks good! The only one teeny little thing I think you need to re-look at is the stacked basket trunks in front of the fireplace! 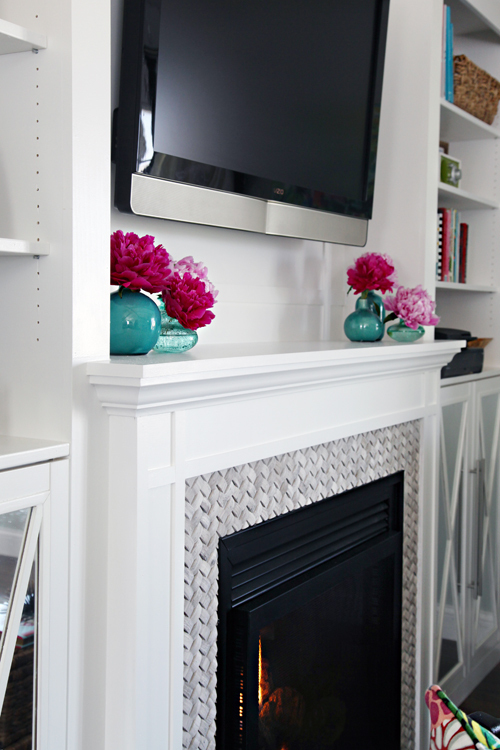 The fireplace with the gorgeous herringbone tile should be a focal point and those baskets are hiding it! I agree Lori. I love the warmth, texture, surface and storage the baskets offer there, but my guess is they will ultimately get shifted to under the window. :) The fireplace is probably one of my favorite elements in the entire space. It's stunning and I love the color palette you picked. So stylish and gorgeous! It boggles my mind that you accomplished all of this in such a short time! Go you!! I think this is the first time, though, I havent liked something youve done. I feel awful just saying it, let the stone throwing and name calling begin. I know its just a style preference but its just not a space I can get into. Im dying to know, can all five of you actually fit to watch a movie or have you moved those activities to the basement. I hope I'm not harshing your groove, since you did such a fantastic job and I do adore your style!!! First, don't feel awful and no stone throwing happening here! It is OK! The space is sure to continue to change and evolve as we begin using it daily. And I would never expect or begin to think that everyone will like everything I do, design and style are just too personal for that. Glad you asked about how we will use the space, I was going to touch on that in the post but got sidetracked. The sofa can fit three adults comfortably (not sure we would ever fit more than that on any sized couch? ), and myself and all three boys (for now - ha!). The chairs can move to face the TV should we pop on a movie and the soft ottoman allows us all to put our feet up. Because we measured for the sofa in a completely blank and empty space with no kitchen island installed, we did land on something more compact, and now that everything is in place we realize we probably could have gone bigger. At this point, it really will come down to using the space and deciding if we really need anything bigger knowing we have room for it. Otherwise, we still have an entire second living space with our sectional and cozy chair which I see us using more for family movie nights and sleepovers, while upstairs will be more for entertaining and day-to-day relaxing. Phew! I hate saying anything negative but i always want to be honest! I also think its hard to really feel your space from the internet!! That couch is much bigger than I thought! I do love the shelf styling and the drapes, so much pretty! Such a beautiful room, filled with color and style! I can´t wait to see it together with the kitchen and dining! It's amazing and just gorgeous, Jen! Love, love, love all of the color! wow!! what a transformation! love to see how it went from empty to completely furnished and styled! loving the mix of colors and patterns in the room, especially if you peel back all the layers, you have a serene, neutral space ... so you can change it to whatever palette you want in the future! My favorite may have to be those two chair and the fireplace! Thanks for sharing your makeover! Congrats! Jen, this is AMAZING! I love the choices of colors and fabrics and the built-ins came out stunning! Very stylish! I can't wait to see how you made the ottoman! Enjoy it all!! Absolutely stunning Jen! I can't even believe you got all this accomplished in six weeks. It looks like it has been compiled over time to a perfectly curated space. SO beautiful! Bright and happy and beautiful. You are a genius! 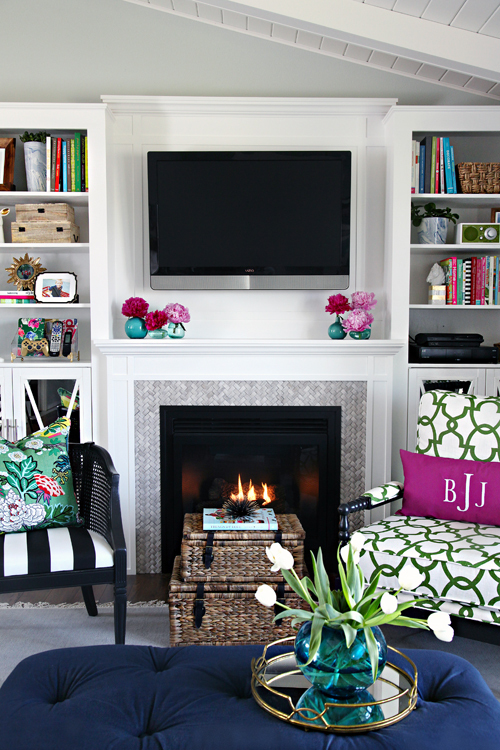 Love, love, love the bookcases on the fireplace wall. What a great addition. Your colors and mix of patterns are so pretty. Gorgeous room. WOW, WOW, WOW!!! Bravo Jenn- FABULOUS! What an amazing space for you and your family to enjoy! Such a transformation! It looks beautiful. I'm so glad to see the chair painted black. We opted for black contrasts in our home, as opposed to white, it doesn't seem to be something you see on design blogs often, sometimes making me wonder if I made a choice I am going to regret later, so the black chair is a nice change to see. Congrats!! You really did an amazing job. Jen, this is absolutely stunning!! Wow! Just, wow! I can't wait until we can see the whole great room! Gosh I love your style! What a great room!! I may have been having mini panic attacks for you throughout this series. You did it. It's gorgeous!!! HOLY SHAZAAM!! I saw the first 2 pictures and I couldn't even wait for the rest. I scrolled straight for comments! I have to go back now and devour all the details. Your space is gorgeous and what a difference! I love it. Kudos to you and your husband!! Me too! I stopped reading and just scrolled! And sighed. And scrolled. what a beautiful transformation!! I just love all the warmth and beauty in this room! Your fabric choices are ideal and so is your styling! Congrats! This is beautiful! A total WOW! I love 97% so much! Can I comment on the teeny 3%? I am wondering about the comfort/coziness level of this room's furniture. I read your comment that this would be more of a reading and entertaining room. What's actually in the room, though, doesn't indicate those activities-- only decorative books on the book shelves and the enormous television on the wall. Also, it seems that the people sitting in the room would have to sit bolt upright on the sofa. Moving the chairs over is an idea but again, sitting upright. I don't foresee any comfy lounging in this room at all. It seems like a set up for non-use of an important room by an active, close family who enjoys hanging out together. Also, the baskets in front of the fireplace? They may be 2 feet away, but I worry the fire would dry out the straw and it would also block much of the heat, too. I'm looking forward to see how this room evolves with "real use." 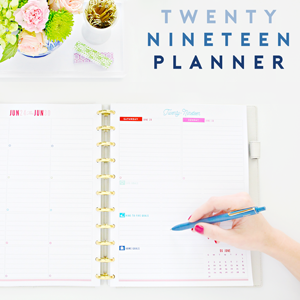 It is gorgeous for a magazine layout, but I bet you'll make comfort and use changes as time goes on. Wow I just locve what you did there... it looks so much better than before. The shoe cabinet in grey gives a much warmer entry into the home, and the selfmade shelves around the fire place are just amazing. Mentioning the fireplace.. I'm kinda jealous^^ although I think the TV above is now way too high, but that's a pretty personal opinion. Oh and good choice too repaint the chair, it's so much better in black. The contrast is really needed there. All in all a very cozy home, thats pretty but still looks real (not like some blogger rooms that look like they came out of a magazine - beautiful but unpersonal). I like it!!!!!! Oh my goodness!! This is so amazing! I love it all! I checked the sources and didn't see that darling striped bag in your entry... would you mind sharing where it's from? Thank you! Hi Jackie! I found it at DSW a few years ago. It is a Poppie Jones canvas stripe tote. xo! I love the fireplace and the role around it! I can't believe you did this in less than two months! The entire rook looks like it belongs in a magazine! I'm seriously in awe. This before and after is just SO GREAT. You've done such a beautiful and impressive job!! Congrats!! I mean, WOW!! You really outdid yourself Jen!! Such a stunning space! I want to plop down on the couch for girl chat stat! Wowza! I can't believe this room came together in 6 weeks! It feels so collected and and well-thought of over a number of years! Love all the pops of color around, so you! WOW, Jen!!! I'm completely in awe of all that you've accomplished in six weeks! You nailed it with the style you were hoping to create, it's the perfect balance of fun and lively but still polished! SO many thoughtful details to take in, I've loved following along! Seriously one of my favorite rooms in this challenge! I love all of the color against the white. I totally would have fallen for that herringbone tile, too, it's perfect! Now relax and enjoy all your hard work! Your living room looks spectacular! I'm particularly smitten with your alternative floral fabric. It was a lot of fun following this project! I really love this! All the colours, textures, patterns... it's just great. You must be so pleased! Enjoy it! Gorgeous! You've really brought the sphistication up a few notches and made it more functional to boot. Well done. I know exactly what you mean about the middle not making any sense! Oh. My. Word. It is stunning! It is modern and cozy and I want to move in. Love the chair in black, the fabric pops so much better! Tile is timeless! Couch looks so comfy. Could you show a pic of how this space flows into the kitchen please and thank you! Love all of the pattern in this room! Looks like a wonderful space to hang out in! It looks so amazing! Ilove it! I can't wait to see how you DIYed the mirror above the shoe cabinet. I LOVE it! You nailed it, Jen! So much personality and sophistication all in one space—it's totally you. Congrats on a successful ORC—time to celebrate! My jaw literally dropped at the first before & after picture!!! So beautiful, as usual. Loved following the process along the way. Love it! It certainly was a labor of love and it shows. You will have so many wonderful times in that room - what a success! WOW! Amazing Jen! This is my favorite space you've ever done! I just love it. Can you tell us what the floral fabric was that ended up being backordered? I would love a post from you on colorful fabrics that coordinate. I am horrible at adding color to my home and you are the best at it!! Thanks for sharing and congrats! Thank you! The original fabric choice was this one: http://lsfabrics.com/fabric/claribel-che00. My biggest tip is to order swatches and carry them around with you while picking out other elements. I have found that swatches tend to look quite different in person than they do while shopping online. xoxo! Catching my breath.... I love this room. My favorites? The wall color and the fireplace tile. I don't know you personally but my impression is that this space looks like you? I love that you made sure to make it functional and family friendly. I think you'll make lots of memories in this room. PS. I think that chair always wanted to be black. Love the fabrics, especially the Dragon! Bravo. The room is just stunning! I love all the pops of color! Beautiful space! Random question... what is the name of the book with the black and white spine on your bookshelf? We have a b/w theme going on on our shelves and I think it would be a fun addition! Hi Jackie! I believe the book you are referencing is "Elements of Style" by Erin Gates. It's a beautiful book, inside and out! Jen! 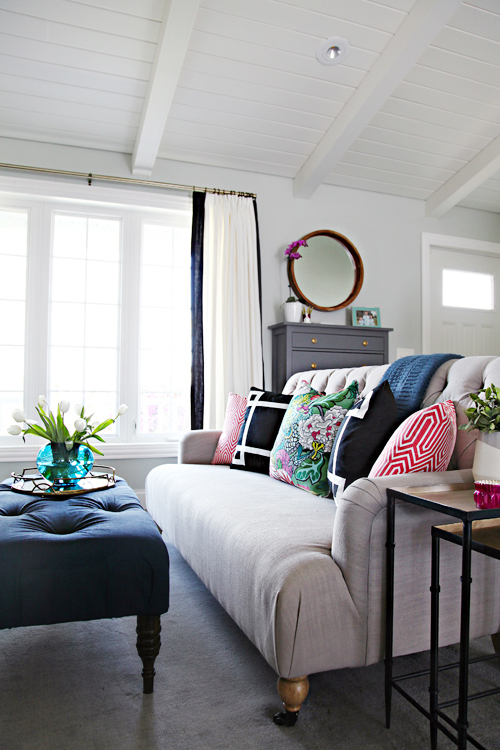 Beautiful, cozy and bright, you hit this one out of the park girl! The fireplace really sealed the deal for both a gathering place and focal point. Now, kick up your feet and enjoy it! I admit, I was holding my breath as I clicked onto this post. You seemed so far away last week! But you blew me away, as usual. Phenomenal. It's so happy and colourful. 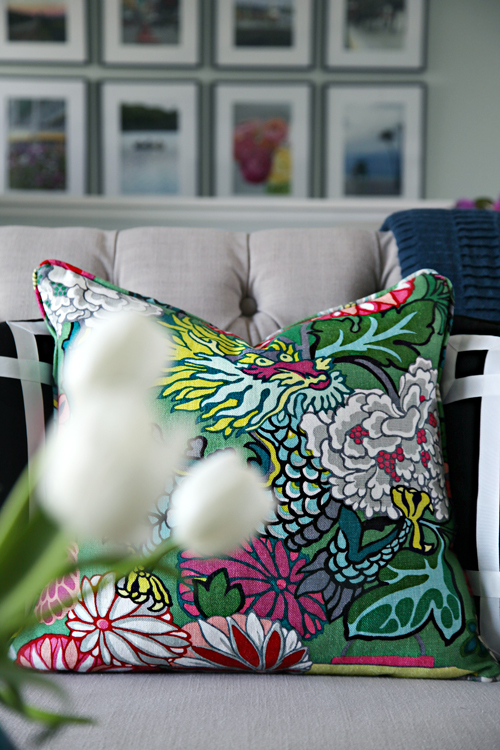 A great lesson in how to use pattern and colour to inject personality. I love how you style your space. 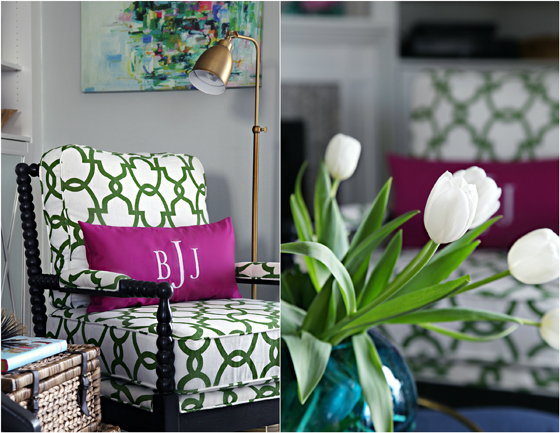 In fact, maybe there's two blog posts there: tips for mixing patterns and tried and true styling tips. Great job! It looks incredible Jennifer! What an inviting space, such a beautiful transformation, you can see the hard work & love! 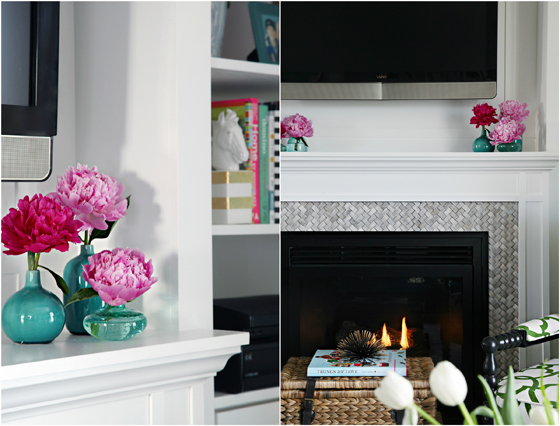 Also, that tile on the fireplace is fabulous - great choice! Beautiful transformation, Jen! 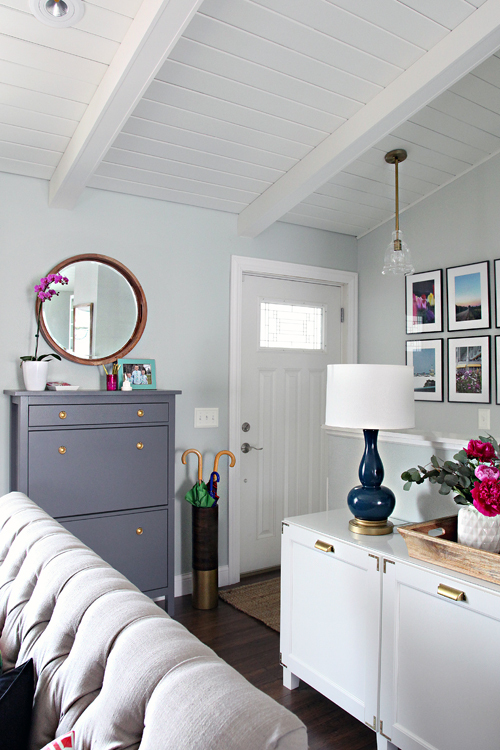 I have one question for you...how are you liking your paint color with the room complete? I simply love everything you've done in your new living room. The color palette is so fresh and inviting. I'm super jealous of your fireplace since that's the one thing I don't think I can add to my home. I get restless and have to move furniture around and with limited layout possibilities, I can't take that wall away. Hope you and the family enjoy your room for years to come and enjoy your well-deserved break! Sigh... the paint color! SO happy I stuck with it for now. I don't think any color would have looked right without all of the layered elements. They really pulled the space together and now I don't know any other color that would have worked in the end. You can probably tell in the photos it still changes based on the wall, lighting, time of day, etc... but each shade works with everything we have brought in. Happy I didn't add the extra step of trying new colors mid-project. :) xoxo! That is a fantastic transformation! The space is perfectly layered and looks so beautiful and inviting! 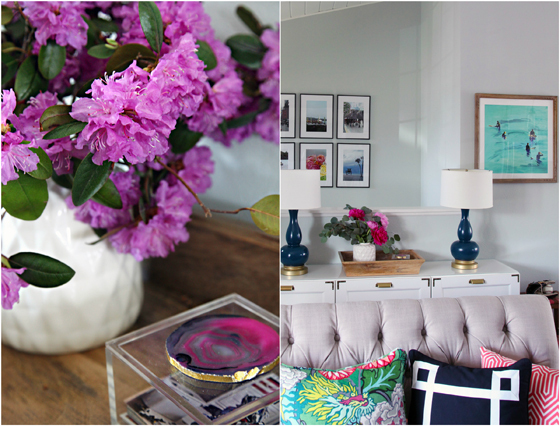 I LOVE what you done to your living room & entryway! I have been a stalker…I mean, subscriber for years and you are such an inspiration to me. There have been countless days (like today!) that I can not wait to receive your email, so I have to go straight to your blog. Awesome job to you and your husband! WOW. I don't typically comment, but this post actually made me gasp. Gorgeous room!! Oh my goo'ness! I LOVE it! Such beauty, such lovely flow of colors. You did an excellent job :-). I love everything about this! So beautiful and bright! I've been looking forward to seeing the finished result! BEAUTIFUL!!! So so gorgeous! I am absolutely swooning over it! Absolutely lovely Jen! Clean, colorful, whimsical, COMFORTABLE. Love "the chair and I had a fight". Love the wall of photos by the front door. Love the space! I have a wall that I would like to install a fireplace as well. Is that a gas fireplace you had installed? Hi Alisha! That is correct, it is a gas fireplace insert. We visited a local fireplace company and they offered us advice on styles, sizes and options, and also installed it for us. We did all of the building of the surround and mantle. xoxo! I'm also putting in a gas insert and I like this one - nice and clean looking. Would you mind providing the brand? I've looked at so many!!!! Thank you! Wow! In love with this room! Looks very chic, great for a couple! I love some of the details here, (especially the bronzy gold tones in some of the hardware and that lamp), but I don't feel any warmth overall from the room. Your designs always have so much white in them and not enough wood tones. But that is just my personal taste. If you were going for cool and sophisticated, then you hit the mark. Holy smokes. You nailed it. I love this. Great job! My eyes about popped out of my head when I first saw this! Incredible transformation! I'd love any bookshelf styling tips; yours look fantastic! Incredible Jen!!!! 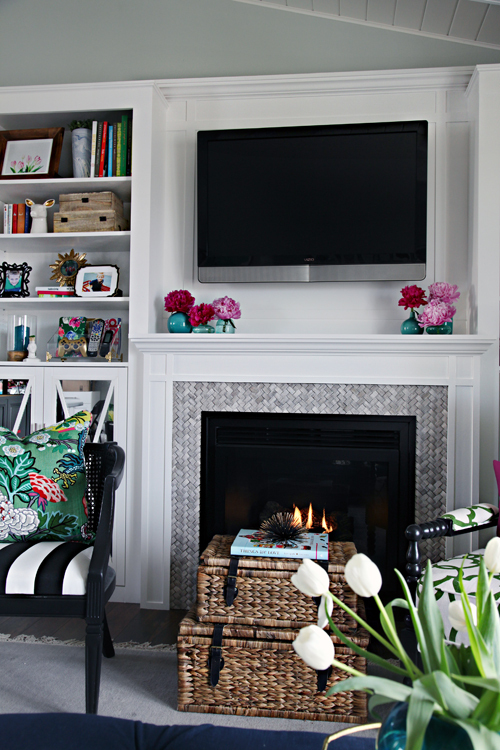 Can't wait to hear all about that gorgeous fireplace - I am dreaming of adding one in our small living room. Beautiful job - you've maintained your whimsical, colorful style but really added a level of sophistication with this makeover. WOW! it is so gorgeous!!! All of your hard work definitely paid off! So, i just can't stop looking at this space. I totally love it! Ahhhh!!!! It turned out soooo beautiful! That fireplace. Is it possible to fall in love with a fireplace? I can't believe you found that tile at home depot, I have a kitchen backsplash to do and must go asap and look for it. I love it all. The colors and textures. Beyond amazing. Waiting for you to write your own book. I'd preorder in a heartbeat. I always love your style. The room is so bright and fresh! I am in love with the white and green trellis fabric and am extremely impressed by the huge space you tackled! Amazing!! Beautiful room. Do the two lamps provide enough light to read on the sofa? Hi Missy, We have canned lights on dimmers overhead so between those, the lamps and the entryway light, we definitely have enough light for reading, TV watching and entertaining. xoxo! L. O. V. E. LOVE IT!!!! Now I cannot wait to see the kitchen and both rooms together as a completed project! You have no idea how much I have looked forward to this reveal....and you did not disappoint one little bit. I have stared and drooled and been amazed and did it all over again. You have soooo much to be proud of, but yes, please sit and relax and enjoy now because you ALL totally deserve to. LOVE IT!!! Now that I have read through all 20 reveals, I must say, I appreciate your rain-boots by the door much more than a random pair of high heels on the floor. I get the effect but prefer your realistic take. Must say, your room is my favorite of the 20. Congrats on a job WELL DONE!! It is absolutely awesome. It looks like y'all will be done with the front rooms just in time for summer!! I went through the hop and apparently my taste falls into your style as your transformation won hands down in my eyes~ Light bright and comfortable. Job well done. Holy Amazingness!!!! I was blown away!!! LOVE!! What a transformation! Your room is absolutely beautiful. I cannot believe how much you guys accomplished in 6 short weeks. 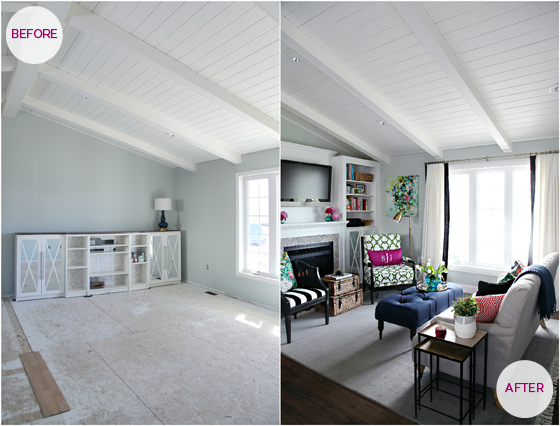 Your plank ceiling has inspired me to do the same in our family room remodel - just wondering which brand and color of white paint you used? It's just the absolute perfect white! Thank you so much! The white is Benjamin Moore's Simply White. Best of luck with your beam project! Gorgeous Jen! I love the new built-ins and those don't even get me started on those chairs! Painting the spindle chair black was a great idea. It really pops now, and well yeah, I love it! Congrats on getting it all done! Enjoy it! It turned out even more beautifully than I imagined. Kuddos! Jen, you did a wonderful job. I am amazed at the transformation. I'm still trying to figure out how you diy-ed that fireplace? It's fun and happy. Love all of it. Congrats! All your hard work is finally paying off and it's starting to look like a HOME and not just a house. So happy for you guys! Luv the new living room, of course. 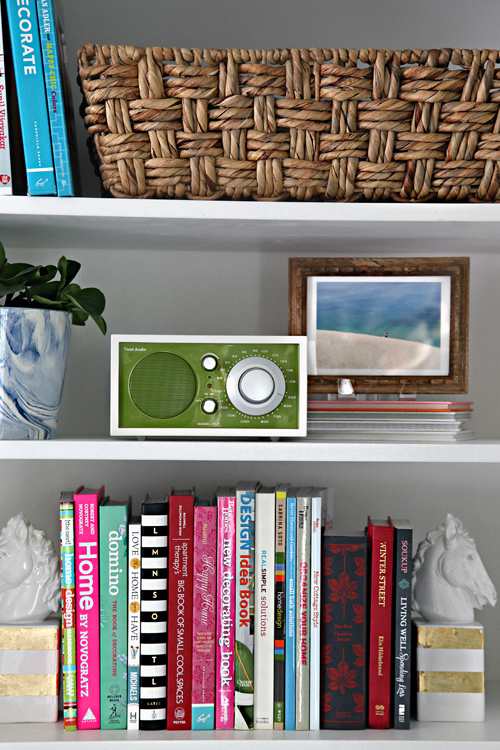 I am also in love with that radio, amazon wish list, added! how do you like it? worth the price? We really love to use it with our phones, however, the radio doesn't always work the best (but it should be noted we live pretty far from any major cities). AMAZING!! I just love the fireplace!! Great job! Just WOW, Jen! So many gorgeous details. I love Chiang Mai in that colorway. The fireplace area really is a total game changer for the room. Such a beautifully executed room!! Jen, this is an absolutely beautiful space! The living room is very well put together. It is eclectic and modern, with hints of the traditional (just what I adore!). You have wonderful taste. Kudos for doing all the hard work - it's clearly paid off! 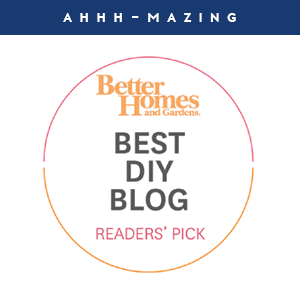 Your remodel is BEAUTIFUL!!!! I love the color pattern. You and your husband did an amazing job! Thank you for your post. Your new space is just perfect. Things you have done, I would never have thought of and it give me so many ideas. Thank you for sharing your new Love filled room. What a beautiful room! Would you sell your photos on Etsy? I can NOT believe you managed this in 6 weeks! With bring sick too! You are a DIY goddess. I literally gasped out loud at the after picture. It's jaw droppingly gorgeous. It is so unique compared t other rooms we see around the blogosphere, which, though beautiful, start to look the same after a while. The wall color ended up looking absolutely perfect as your neutral backdrop, and you layered in the colors just amazingly. I'm serious when I say this is one of my favorite rooms I have seen on the interwebs. What an amazing transformation! A true job well done. I just love the color palette you selected. It feels fresh and happy. The six weeks went by so fast. I completed our entry, living and dining areas in a new to us 30 year old house. So, cheers to us! Have a wonderful weekend. Amazing space! Where did you get the bins in front of your fireplace? I've been looking for ones like that to put my kids toys in! Hi Kelly! The stacking baskets are from HomeGoods. And they are great for kiddos - we have already loaded ours up with books, blankets and a few toys. :) xo! Wow! This room is really gorgeous. I was wondering how is watching the Tv from the couch? I love the look but I find that it can straining looking up all the time, is this something you noticed? Thanks Sushmita! We have only been living with the TV mounted for a few days so far, but what we do love is that we can swivel it and see it while in the kitchen and dining areas. It also doesn't seem too high while on the couch when we kick our feet up on the ottoman to watch a show - but we haven't done any long term sitting and watching yet. xoxo! AMAZING! I'm so inspired to get my own living room shaped up. I love the colors that pop against the neutral background. It looks polished but homey, what a perfect combination! Did you think of using the navy panels you made last year for the windows? I loved how they tied your space together and it seems like the color would pop with the rest of your pieces. You nailed it! Every element comes together to create a gorgeous and unique space! My favorite has to be the herringbone around the fireplace. I love your style! I can't wait for the tutorial of the mirror. I was just looking at ideas to make one today and then I saw your picture. Where did you get the wood? Beautifully done!!! Can't wait to see photos of how the LR connects with the Kitchen. 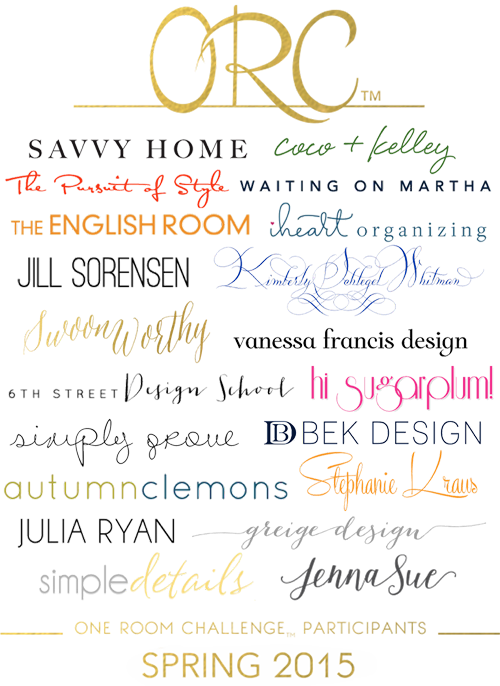 I love every fabulous detail Jen! Way to go!! Beautiful transformation Jen!! 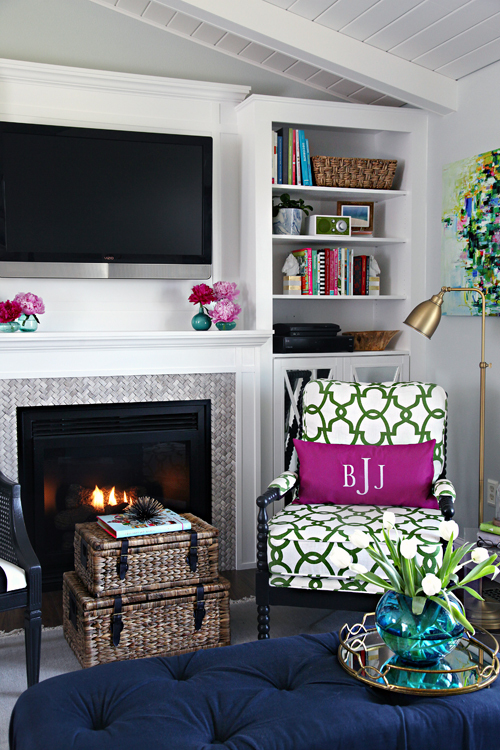 Love the DIY, bold colors/patterns, and how sleek, inviting, cozy this space is. I'm coming over. Awesome ending, such vibrant cool colors!!! You are truly an inspiration!!! I do have a question, what happened to the middle part of your entertainment/bookcase? Oh it is beautiful. 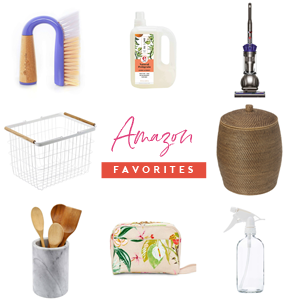 I cannot believe all of the DIY projects. I love the pops of color. You definitely hit the fun mark. Love this makeover. It amazing. Well done to you and your hubby. Can you tell me what size that amazing piece of art is. Gorgeous! Brilliant build in. I just love your blog- filled with such clever ideas! Ummm, fabulous. This room really came together. It's simply stunning. And the paint color? Perfect. I didn't even really "see" it with all the other gorgeous stuff in the room, but when I finally did- I thought, it's perfect. Great job! So pretty! I love how the walls are neutral but it still has such a vibrant feel from all of the textiles and art. What a lovely space you've created for your family! 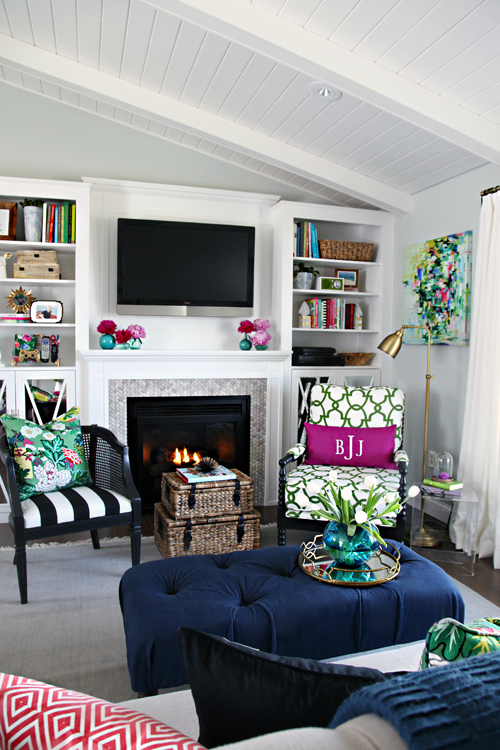 I love everything about this room especially your colorful fabric selections! You have done an outstanding job! Simply gorgeous! Thank you for posting all the trials and tribulations, it kept it real for me. I love your projects and ideas. Wow. Jen, this is my favorite of ALL the room transformations. Everything you did is perfection. I'm sure you see room for improvement, but I can't even fathom how it could possibly get any more magnificent than it is now. I love your fabric choices, even your substitute fabric. Gorgeous. I'm sooo glad you repainted the chair black. It just *pops* now! And your artwork is the perfect colorful finishing touch. That painting behind the black and green chair!!! <3 Pretty please, come to Ohio and do mine next! Enjoy your gorgeous new space. Can't wait to see the finished kitchen!! What a beautiful transformation Jen! You must be so happy that you now have a stylish and functional room that your family can enjoy. Love the planked ceiling and how you layered the space with fabric, accessories etc. Kudos! Love the room! Could you please tell me about the colorful abstract painting to the right of the fireplace wall? I love it but can't find any mention of it! This is just beautiful, Jennifer. It feels both very friendly and very elegant, which I think is tricky to do. 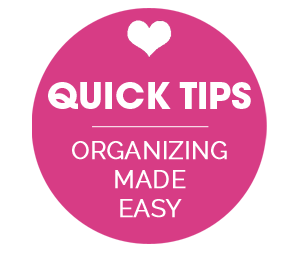 I hope you have fun relaxing and organizing. :) Yay. Wow! Looks totally curated. Love it and the colours you've incorporated. Great work. I love the abstract painting. I visited the website you listed as the source. 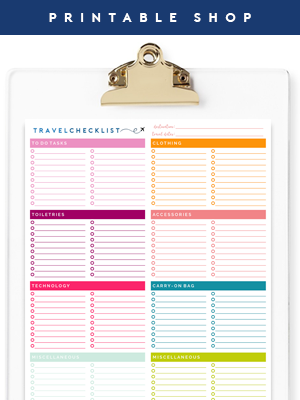 It looks like they are printed on paper, but yours looks like a gallery wrapped canvas. Did the Etsy shop print it that way for you? Thanks! Oh my God, I can´t stop staring at this amazing room. I want one just like that!! Let me know if you ever come to Argentina. If you are looking for a challenge, the lack of options should be one! lol. I look at your room (all your house, actually), and I think.. ok... how can I do all of this in my tiny single apartment, without Ikea, HomeDepot and such, without any ability for DIYing... ? (sight) :) Best of lucks from Buenos Aires! So wonderful. I love how cohesive it is; looking toward the fireplace and toward the stairs. the fireplace tile choice -superb! I'm just not sure about the mirrored doors, especially now that it will be a shared space, there is just so much going on on that wall there is no place for the eye to rest. However that does also make your eye skip over the tv too. If only my husband liked this colour palette. Sigh. Jen, what floral fabric were you originally planning on buying but then got the ming dragon since the first one was on backorder? Awwww Jen! Wish we had houses like yours here in the UK!! You and Bryan have done an absolutely fantastic job turning a lovely House into a stunning Home for you and your Little Princes. Can't believe it's taken you Both just 6 Weeks!!! Well impressed! I love everything that you have done, and am sure you will have many happy hours there. Enjoy, Hun!! LOL it is two months after you're finish and I'm still not finished with mine! When I read about this challenge I thought "I'm going to do this too!" It took me a few weeks to get started but I had the motivation and then I couldn't find a bookcase! I am re doing my sons room and wanted a real wood bookcase. So we decided to make one and it has decided to rain or be too humid everyday since to paint the pieces, well that is my excuse anyway. Is everything else done? No. But thanks to you I've been inspired to actually decorate my home. Thanks! What did you use to paint the chairs? I used regular latex enamel paint from Sherwin Williams and Benjamin Moore. I love the ottoman and want to make/get something similar for my living room. Are you planning on doing a tutorial on how you made it? Thank you Stephanie! I am planning on doing a tutorial, I just have to re-pull the fabric and take a few new photos. xoxo! Stunning result! Great job by the way. Simply beautiful!! Can you please tell me where you got the 3 frames from above your remote caddy? Lovely ~ what is your wall paint colors? Love this room! Do you know the name of the fabric on the chair, the green and white?